I have a 3' ponytail palm that I keep indoors. My cat constantly chews on the ends of the leaves since I don't have a place to put it that he can't get to. I bought bitter spray from the pet store, but it doesn't help much. The leaves that were once gorgeous, long, and curly are now short and spiky. The leaves don't appear to be growing back. I know the leaves won't grow from the ends. I don't know how best to make the long leaves grow back. Should I try to move it outside and leave it alone for a while? Should I trim the chewed ends off? Should I trim the tree back from the leaf base (and if so, how? ), or is there something else I should do? 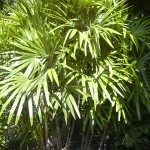 Your ponytail palm - which isn't a palm, by the way, it's closely related to yucca - only grows leaves from its central growing tip, at the top of the plant, so there's no way to make the long leaves grow back, except to let the plant continue to grow. I'm sure it would love to spend the summer outside, no direct sun please, just monthly fertilizer to encourage leaf growth. You can grow greens for the cat, which he/she might enjoy - you might have to try several kinds before you find one they like - but that won't stop them from wanting to eat the ponytail. I have several cats, and there are many plants I can't keep in the house. Fortunately, there are many kinds the cats don't like: philodendrons, aglonaemas, cacti, ficus, syngonium, grape ivy, ferns,and some others here and there. Why don't you try some small samples of some different plants, to find the ones your cat doesnt like.